I need to apologize to you, dear reader, in advance. You see, when I found out I would be enjoying a week in Mazda’s latest iteration of their iconic roadster; I already started to think about a photoshoot location for it before getting the keys. When I choose photoshoot locations, sometimes I try to find somewhere that somewhat reflects what the car represents. Other times, I’m short on time and I take pictures wherever and whenever I can. But I knew this car was going to be special before even driving it. 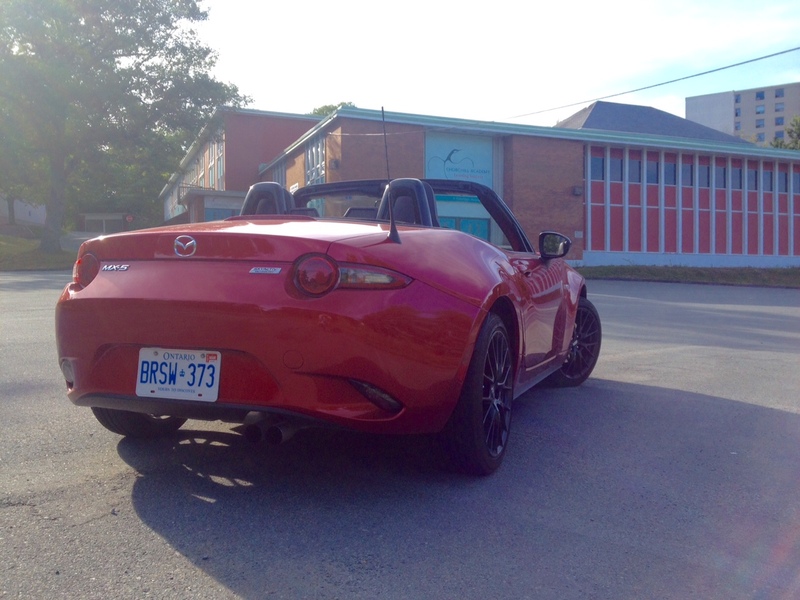 So I had it all figured out: I would take a lovely jaunt over to Queensland beach, Carter’s beach or Rainbow Haven beach – all in Nova Scotia – to showcase not only just how photogenic the scenery of our beautiful province is, but how photogenic MX-5 is and how it could easily be a poster you your wall. First I went to Queensland: beautiful day, beautiful location, beautiful car. After hanging out at the beach for about an hour, I realized I was distracted. All I wanted to do was get back into the little two-seater and drive it again. So I did back towards home. About halfway through, I realized I forgot to take pictures of it; the very reason for me being there in the first place. No matter, I thought, there was still Carter’s beach or Rainbow Haven. Each time I went, I got distracted by the car. All I wanted to do was drive it. I didn’t want to stop anywhere. I just wanted to keep driving it for as long as I could. And each time I would forget all about the photoshoot. The next thing I knew, I was being asked to hand back the keys. “Crap!” I thought. 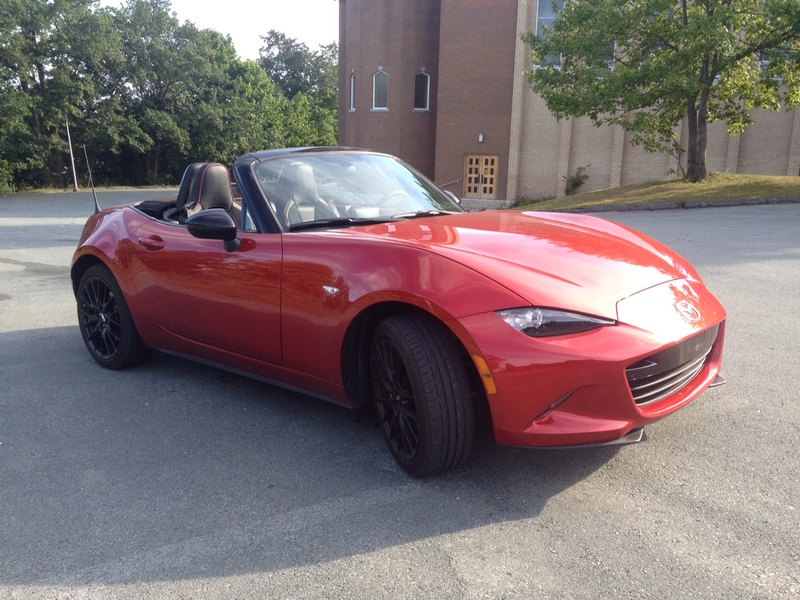 It donned on me that I had not taken any pictures and the MX-5 was to be returned in an hour’s time. So I rushed to clean and fill it with gas and then I took it to an empty church parking lot to snap some haphazardly shot photos. If this were your run of the mill crossover or family sedan, I probably wouldn’t feel the need to apologize. But this car is truly special. It deserved to be showcased in a more appropriate way and you, the reader, deserved to see it displayed as such. So I apologize; but once you read on, you’ll understand why I kept forgetting. Unfortunately – we as a society – seem to connote feminine-like styling as something unappealing when it comes to cars. This is something that has always afflicted the MX-5 and, subsequently when it was called the Miata. It seemed people were intrigued by the car but “wouldn’t be caught dead in one” due to its small size, soft lines and curvaceous body. I personally think that’s an ignorant outlook, especially since all it takes is one drive in any Miata or MX-5 of any generation to be completely sold. Still, it seems Mazda was growing tired of the criticism so they attempted to add a bit more masculinity to the design. This means an angrier looking front face, a more muscular side profile, and a more distinguished rear end. 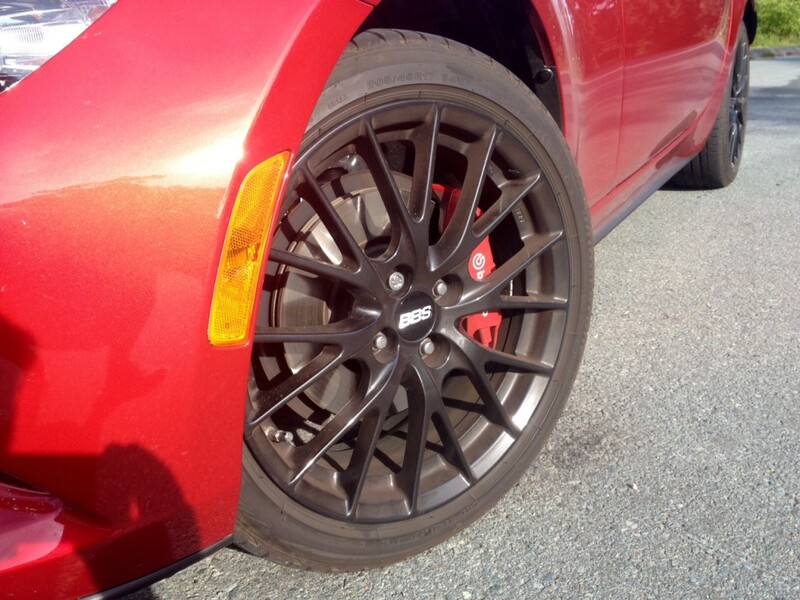 If you add on the $4,400 sport package, which nets you excellent Recaro seats, black 17-inch BBS wheels and red painted calipers which hides the Brembo brakes, it both adds and hits at its performance credentials. The rear end styling may be the most polarizing part of the car – with most saying that it seems a bit too soft. Others seem to like that it reminded them of a blend of Jaguar and BMW roadster styling. But there’s no doubting that it is a looker. The orange Lexus RC 350 that I had a few weeks ago may be the only other press car I’ve had this year that garnered more attention than the MX-5. While it looks fairly decent and still proportioned with its cloth top up, it definitely drew most of people’s attention with the top down. Its small size likely also played a role. But in my opinion, this is the best looking MX-5/Miata design yet. 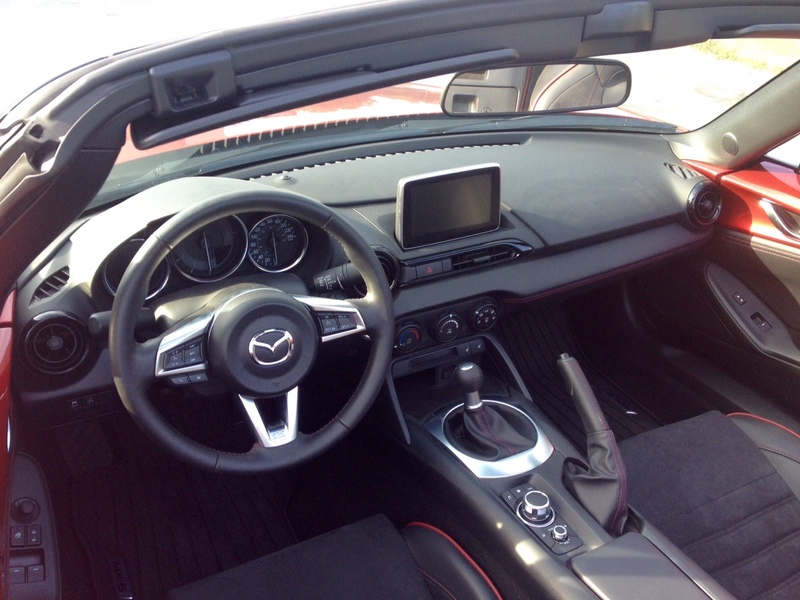 Mazda has also done some refreshing to the interior. Its design and quality are top notch, as is the case with most new Mazdas. However, in terms of ergonomics, it definitely misses the mark. The control knob for the infotainment system, which is located between the seats, is placed a little too far back and the cup holders are in a great spot if you constantly want to hit your funny bone against them while driving. I can only imagine that you would spill your coffee everywhere with one shift into second gear. There’s also no glove box and the infotainment screen seems to be angled away from the driver. There’s a small cubby hole for storage in between the seats but it can barely fit a cell phone. Here’s the thing though. While these faults are obvious, I won’t chalk them up as criticisms because that would be like criticizing a Ferrari for being incapable of going off-road or lambasting a Prius for not being able to crack a three-second 0-100 time. It’s not their purpose. And it’s not the MX-5’s function to have loads of usable space for all your stuff. If that’s what you want, get a wagon. 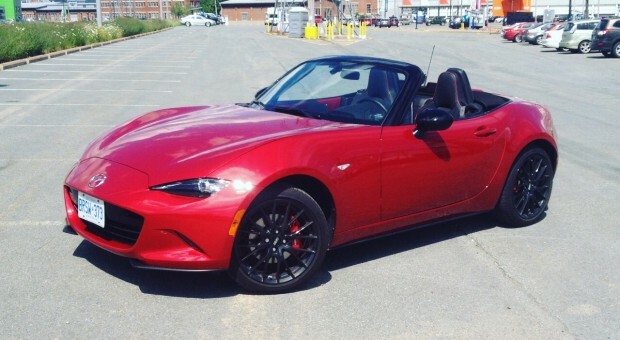 Besides, it isn’t as if Mazda has completely screwed over MX-5 buyers who also want to haul some stuff. For instance, the trunk size can easily fit an overnight bag or a few grocery bags and the trunk size stays the same whether the trunk is up or down. And, in addition to fairly deep cubby hole between the seats, there is also a cubby hole directly behind each seat for a total of three. It may not be the most versatile or convenient way of transporting your stuff, but it is at least still doable. There is currently only a soft-top available (though a hard top targa-style roof is coming). It’s not electronic, but that’s very much a good thing. Not only does it save weight, but it also saves time. Unlatching the roof is so simple and quick. In fact, I had a friend time how quickly I could get the roof down and my best time turned out to be literally 3 seconds flat. Compare that to the 12-20 seconds it takes power roofs to fold. And the best part is, operation of the roof can be done all while inside the car because it’s so small to begin with – no need to get out to put the roof up or down. That also means that you can get open air driving whenever your heart desires whether it’s at a red light, or even on the go (though I wouldn’t necessarily recommend doing the latter for safety reasons). The MX-5 gets only one engine choice at launch and it’s a 2.0 litre inline-4-cylinder which produces 155 horsepower and 148 pound feet of torque. I know what you’re thinking; Mazda’s own compact sedan can generate more power than that. And on top of that those power numbers are actually down slightly from last year’s model, but the new MX-5 is also down in weight. The end result is a little car that feels faster than it is realistically going, but that isn’t a bad thing at all. Not only does it ensure fun with a decreased possibility of a speeding ticket, but the rather nice sounding exhaust note adds to the sensation of speed. If you mate this engine to the six-speed manual, and you’re a fool if you don’t, then the experience becomes an absolute pleasure. The stick shift is near perfect both in terms of size and operation. You want to downshift from 6th to 4th? Go for it. There is little possibility you will miss the right gate. It is predictable and just the right amount of snickity. I’ve always been a fan of manual transmissions in general but this one is as satisfying as a cold beer at the end of a long work day. So, we’ve got a marvelous engine mated to a tremendous transmission. That’s all fine and good but let’s be honest, great handling is what performance enthusiasts crave. 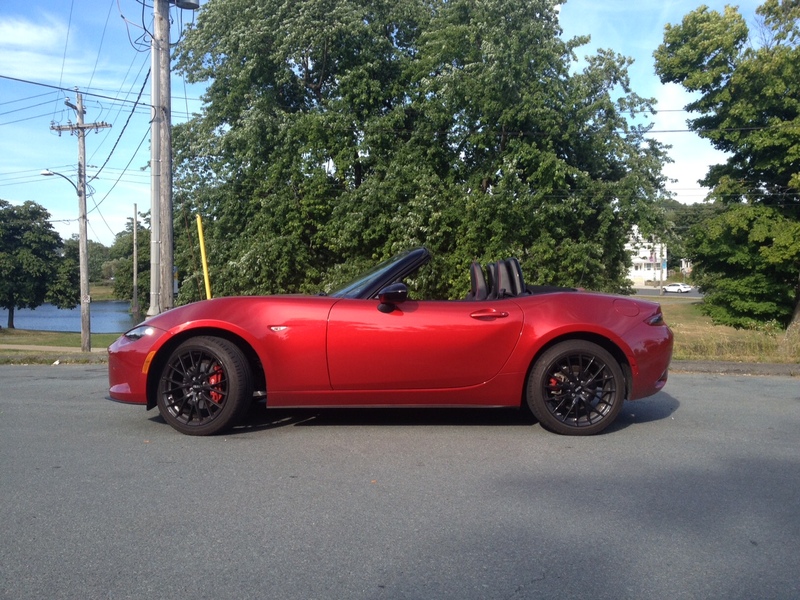 You may be surprised to learn that the MX-5 isn’t exactly perfect in this area. There is body roll, and not just a little bit, a noticeable amount. But before you go banging your head against the wall, you should know that, oddly enough, the body roll barely – if ever – interferes with the experience. 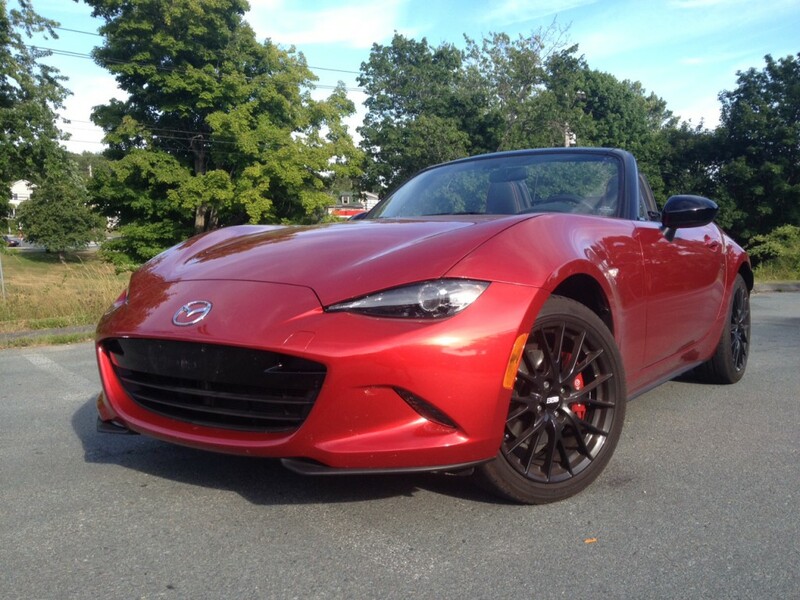 At first it’s a bit off-putting, but you get used to it so quickly that you anticipate it which gives you confidence to actually push the MX-5 more. 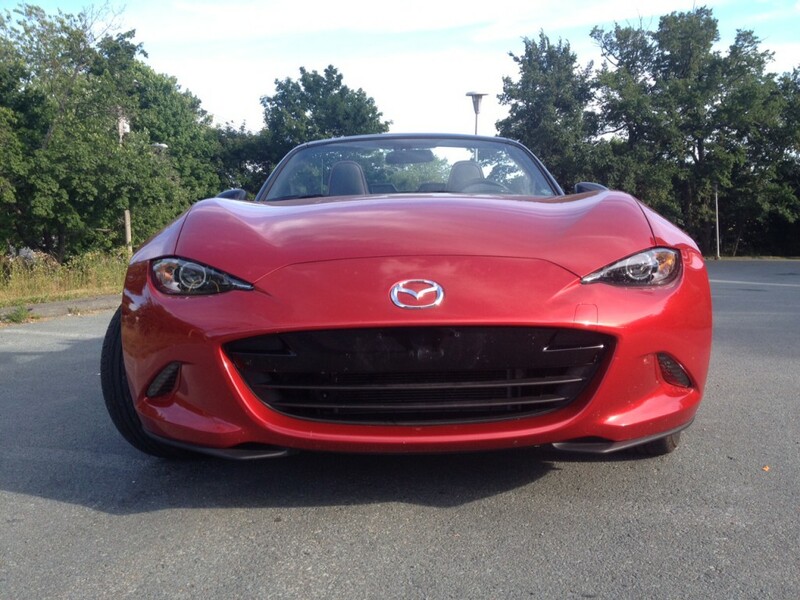 Once you get this confidence, the MX-5 – and you, but extension – start to feel invincible. Not in a reckless driving kind of way but a “wow, this is what life is meant to be” kind of way. Turning into a corner in the right gear with the nice feedback from the steering wheel is a genuine thrill. It feels poised, surefooted and measured. It’s so satisfying to drive that you’ll often find yourself looking for excuses to drive it. I often found myself texting my friends asking them if they needed a drive anywhere. I would convince myself that I was running out of toothpaste and needed to go buy some more even though there was still half the tube left. I would purposely take the long way everywhere I went. And the best part of all of it is that you don’t end up paying for all this unnecessary driving at the pumps either. 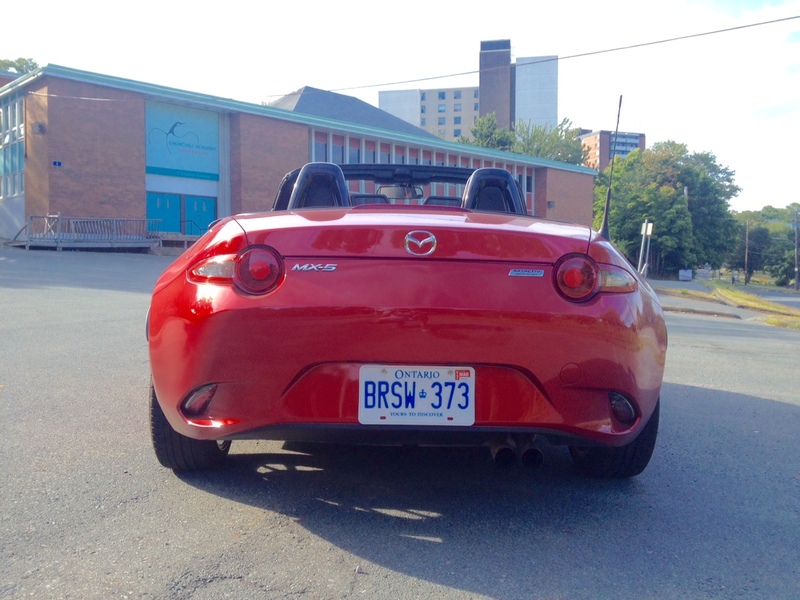 Officially the MX-5 is rated at 8.9 L/100 kms city and 6.9 L/100 kms highway. In my week of real world mixed driving, I was able to return 7.0 L/100 kms. That’s about what you’d get from a Honda Fit equipped with a manual transmission. So, we have a good looking car with a quality interior that is so much fun to drive that you drive it for no reason and you don’t end up feeling guilty about wasting the gas. Now you know why I kept forgetting to take decent pictures of it. As nice as it is to look at and photograph, it’s nicer to drive. And that’s all you’ll want to do if you own one. This is as near to perfection to driving – for its price point – that you can get today. And as such, it doesn’t really have any immediate competition. With that being said, it’s still expensive. My tester is the mid-level trim which means a top GT trim could find itself well into the high 40 thousand dollar range. But considering its price is likely its only fault, when everything is relatively considered, means Mazda continues to have a hands down winner on its hands.